The SB-3879 is a professional high performance video graphics scaler supporting seven (7) different inputs and output signal, HDMI™, VGA and S/ PDIF & Stereo Audio. 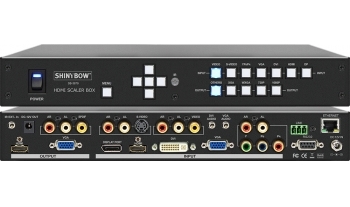 The Inputs are comprised of 1x Composite Video & Audio, 1x S-Video & Audio, 1x Component Video & Audio, 1x VGA & Audio, 1x DVI & Audio, 1x DisplayPort and 1x HDMI™. The available output ports are 1x HDMI™, 1xVGA, 1x S/PDIF and 1x Stereo Audio. 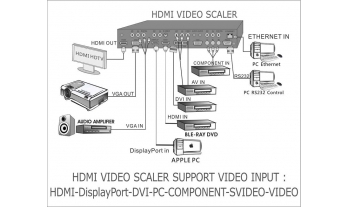 This scaler supports S-Video with 3D comb filter, HDMI™ 3D 1.4a formats, HDCP 1.3 Compliant. It is able to auto detects the video standard format of input signal from NTSC / PAL / SECAM system, and convert to high definition RGB digital HD signal. 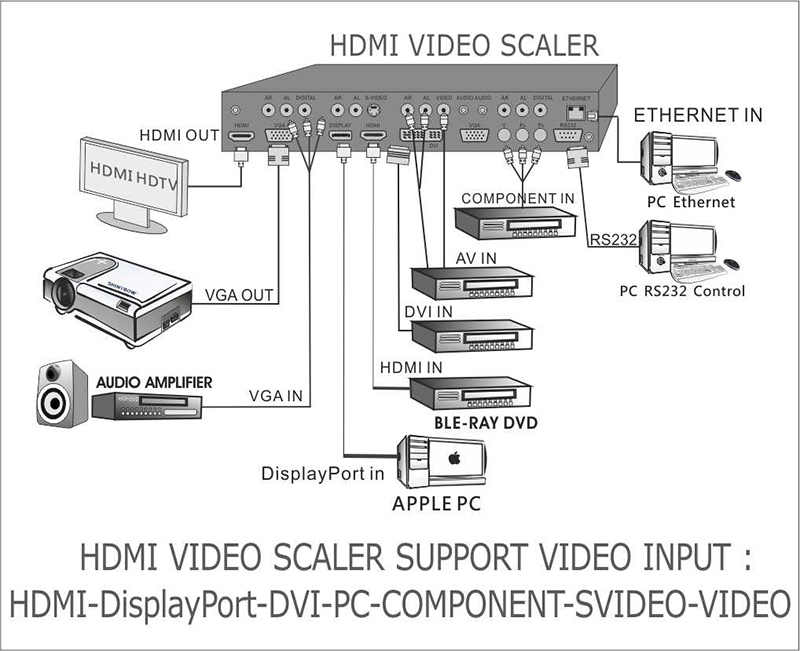 The scaler supports full HDTV resolution data rates enabling 480i/p, 576i/P, 720p or 1080i/p formats, higher DVI resolution (1920x1200 ), HDMI™ 1080p- 60, DP (2550x1600) which is ideally for high definition 3D TV, HDTV, Plasma display or monitor applications. Control is provided via front panel buttons, RS- 232, Ethernet, or IR remote control (included). A RS-232 interface is provided for interfacing with third party controller. The windows-based control software package is included to provide complete control of the SB-3879 from a PC. 06. Bypass XGA & 720P 120Hz 3D signal for DLP link 3D ready projector for active 3D display.